Another goal I would like to accomplish during the course of this project is that I would like to make a suit jacket that I enjoy wearing. Blazers have always been tricky for me: they make my shoulders look huge, my torso boxy, and the entire look is stiff and mannish. I occasionally find blazers at thrift shops, but the fit is usually “almost” at best, so I have resigned myself to the idea that blazers that fit and look good are far beyond my budget. 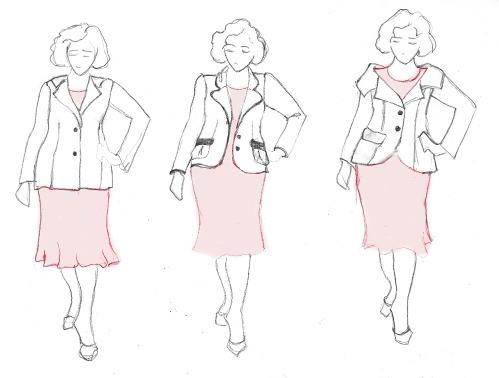 Apparently, it’s been a long-held intention of mine to remedy this by sewing my own blazer, customizing the fit where needed, because in my pattern collection I have quite a few patterns for suits and jackets, things that I clearly thought, at one time or another, might be good possibilities. And looking at them anew, I think I may just have something here.